My aunt worked in Goldbergs, used to remember going to meether on a saturday. Used to love the christmas displays they done at their side entrance, all i remember of it internally was all the lifts being together with the stairs. Wish i could go back in time and see all the 70s and 80s stuff again. tobester wrote: My aunt worked in Goldbergs, used to remember going to meether on a saturday. Take a trip down to the CO-OP in Clydebank. The place is in a time warp. The BBC uses the Clydebank Co-op to film the sketches with the 2 electrical salesmen in Chewin the Fat. The shopping centre has been used for filming Still Game & Karen Dunbar shows as well. The two un-reproduceable smells have to be the 'old' underground and the Food Hall in the basement of Lewis's. Ground coffee ,baked ham, chocolate, cheese counter,funny how remember smells better than other senses. cumbo wrote: Ground coffee ,baked ham, chocolate, cheese counter,funny how remember smells better than other senses. I've forever got the scent of Lewis's Food hall impregnated in my mind. It wasn't the brightest of places from what I remember, all rather subdued lighting IIRC bu the grub more than made up for it. Is it true they went under because the store wasn't ready for Christmas ? glasgowken wrote: Is it true they went under because the store wasn't ready for Christmas ? In a funny sort of way, I hope that's true. Ah! The biannual trip (birthday and Christmas) to the toy department with my dear old aunty May. Wonderful memories. Though I never did get an Action Man helicopter. 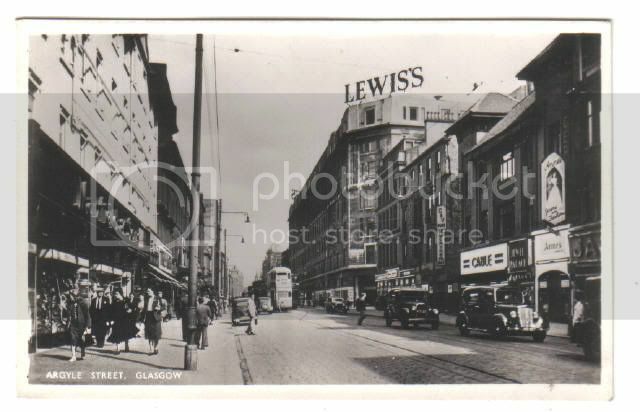 Can anyone remember a shop across Argyll Street (possibly part of the same block as Boots) which had an old gated lift, complete with uniformed attendant, right into the 80s? Or is my memory playing tricks? Originaly posted by Crusty Bint.